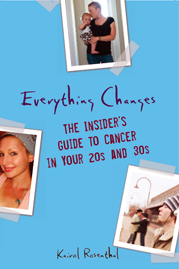 Everything Changes – The Guide to Young Adult Cancer » Cancer and Nutrition: Trendy Scams or Smart Advice? One of the first emails I got when I let friends and family know about my diagnosis was from someone who had found this ‘amazing cancer curing diet’ that I just HAD to try. It made me SO mad. THERE IS NO FOOD, SUPPLEMENT OR DIET OUT THERE THAT CURES CANCER! A healthy diet can help to reduce your risk of developing cancer (along with exercising, not smoking and drinking only in moderation) but once you’ve got cancer, all the fresh, organic fruit and vege, vegetable juice, mangosteen juice, acai berry, pomegranate or whatever the latest ‘superfood’ is sadly is not going to magically get rid of your cancer. You have to hope that your cancer responds to treatment – chemotherapy, radiotherapy and surgery. A qualified dietician who knows your circumstances is certainly the best person to advise you on the most appropriate diet during treatment – and you may find that it runs counter to what most would consider as a healthy diet as some people lose a lot of weight throughout treatment and need to keep their calorie consumption up. After treatment, a healthy diet may help prevent a recurrence, along with exercising, not smoking and drinking only in moderation. As far as my own diet goes…well I didn’t think it was unhealthy before I got cancer. I already ate plenty of fruit and vegetables, organic when possible. I already ate only grass fed beef and free range/organic chicken and pork but now I eat less meat overall. There is plenty of research based evidence to indicate that you should eat less than 500g red meat/week and cut your consumption of processed meats such as salami and smoked chicken altogether as these contain harmful nitrates. I already chose wholegrain products over refined – eg wholegrain bread and brown basmati rice. But now I usually bake my own bread as much as possible – that cuts out a whole raft of artificial ingredients that are found in standard supermarket bread and it doesn’t actually take that long (on a side note, I only just learnt what a difference there is nutritionally between stoneground flour and flour milled using modern methods). I didn’t eat much junk food before but now I eat even less – no more grabbing a packet of crisps or chocolate bar when I’m feel a bit peckish. I try to eat less refined sugar. I don’t drink alcohol at all any more. I’ve been pretty frustrated with the nutrition component of my cancer experience, starting with the plain fact that I wasn’t “supposed” to get rectal cancer. I had actually been studying to get my masters in nutrition when I was diagnosed–I literally was working on a group project presenting a paper on colorectal cancer rates in men of a particular demographic the day the biopsy results came in. Needless to say I dropped out that very day–it was way too much to take. Because of my background, I knew a little more than the average person about nutrition. I think that might have worked against me from the get go, making the Why Mes even more pronounced. I was also incredibly frustrated by how limited my diet became as I went through treatment (read: no produce or whole grains). It seemed like some kind of cruel joke that I was incapable of eating (and digesting…) the very foods that were supposed to reduce the risk of colorectal cancer! I also ran up against some obstacles with the head Registered Dietician at the hospital. She was this incredibly rude and old-school woman who seemed unable to grasp the concept that I didn’t eat meat. In addition, any time I come across the phrase “SUGAR FEEDS CANCER!! !1″ I have to work hard to not roll my eyes so far back into my head that I snap my optic nerve. 99% of the time this phrase is being thrown around by people that do not have a legit nutrition background–unfortunately they are sometimes MDs, giving people a false sense of intellectual authority. So, other than having the occasional fit of frustration, what am I doing about my own nutritional intake? I try to eat more fruits (vs. veg which are just too hard for me to digest) and eat less in general. I’m still eating mock meats which may very well have been the cause of my cancer (being that they are a processed food), but I don’t know that I’m ready to go back to eating the real thing. Brigita – Oh the sick irony of your diagnosis and training. Oy Vey! It highlights the fact that a lot of “cancer fighting” diets for cancer patients are not adaptable to the limitations of patient’s bodies that have been altered by surgery or other facets of disease. You raise a good point about MDs knowledge of nutrition. I have two good friends who are doctors. They are so honest about their profession and it is good/scary to hear about their behind the scenes experience. The one said she has so little training in nutrition that when a patient for example with heart disease asks about nutrition, she has to say to the patient “Let me get you a helpful print out.” She goes down the hall prints something off of a good heart association’s website and skims it one the walk back to the exam room so she knows what to say. She didn’t go to a crackerjack med school either – in fact she studied at one of the top ten cancer centers in the country. Oh right, I forgot, negative thoughts caused the cancer. Not speaking up? (It’s that throat chackra imbalance.) Not loving enough? Now I am not supposed to eat sugar. And I have to exercize alot. And think positive. Damn the pressure! If only I could do everything perfect, think everything perfect, be perfect, eat perfect, then I could be well….For me good health has been for years elusive so I’ve stopped chasing it. It’s too stressful. So I just taking it day by day. I think the only thing they know for sure is smoking too much and drinking too much ARE really bad for you. I agree a cookie won’t kill you. Nor will a coke now and again. ALK – I had bad flashbacks reading your comment. I lived in the Bay Area when I was diagnosed with thyroid cancer and EVERYONE was telling me it was a problem with my throat chakra because I didn’t speak up enough. They learned really fast that I have NO problem expressing my opinions! Glad you have a sane balanced attitude towards it all. Do I ever feel frustrated about nutrition? Yep. Have I ever used a registered dietician? Yes, my local onc’s practice has an RD on staff whose job it is not only to be there for people who make appointments, but to circulate in the chemo infusion and waiting room, touching base with patients about their diets during their infusions and being available to caregivers killing time waiting for their patients. Luckily for me, Theresa is not only an RD but a person who embraces continuous learning – so I didn’t get a lot of confrontation while I was on treatment. Instead, Theresa was intrigued by my low carb diet (which focuses on minimal carbohydrate levels, healthy fats and at least 1g of protein per lb. of lean body mass…yeah, I’m one of *them*!) She respected my determination to continue to eat the way my research has demonstrated is healthiest, and over time, was impressed by my results maintaining a healthy body weight during treatment. While Pollan is a good reading choice about food, I personally recommend Gary Taubes, ‘Good Calories, Bad Calories.’ And I recently discovered and reviewed Rebecca Katz’s other cookbook – ‘One Bite at a Time’ – which is full of inspired ideas about ways to tempt a cancer patient’s palate. I’m not an RD. I’m not a doctor. I have studied nutrition extensively since 1990 when I started running nutrition studies at work (pre-clin pharma research.) I admin a nutrition support forum, and work with the bariatric MDs who created the low carb diet plan I follow (they own the support forum.) I’d been following their way of eating for two years before dx, and they were two of the first docs who reviewed my blood tests before my dx. Like Brigita, I had eaten according to what is supposed to prevent cancer (a low fat, whole foods vegetarian/pescatarian) for 25+ years prior to dx. I was a gym rat – weight lifting, cardio and very active. I was a healthy weight and body fat percentage. Low carbing – reducing carb intake to <50g/day – also controls those insulin spikes Brigita mentions, and does it in a way that is far more accessible and controllable for me than exercise. No, a cookie or a coke once in awhile isn’t going to kill you…and I’ve always said that my eating rule was ‘whatever looks good’ on an infusion day, and low carbing the other 5-6 days of the week. But the problem is that most people’s version of once-in-awhile is a lot more often than is good for them…and for many folks, ‘moderaton’ is a pretty elastic description. Kiarol, sorry I gave you a flash back. My sister had to move back to NYC from SF after this incident. She was hosting a party and offered someone a chair and they proclaimed: chairs are so hierarchical. So it’s not anything to do with anything I did other than being born into this family. still that’s what people think sometimes. I’m interested in finding out a bit more about the low carb diet – all I think of when I hear that phrase is the Atkins diet. I did come across this article http://www.bodyrecomposition.com/nutrition/how-many-carbohdyrates-do-you-need.html which was interesting (I had to google Lyle McDonald – the blurb I found said he’s a “physiologist and author who has spent over a decade obsessively finding ways to apply cutting-edge scientific research to sports nutrition, fat loss and muscle growth”). The article notes that those with good insulin sensitivity tend to not do well on low-carbohydrate diets. Hmm, so how do you know if you’re one of those people? I’m curious how much the low carb diet acknowledges the part that modern production methods, pesticides and artificial additives may play in food allergies and intolerances. How many of those who are gluten or wheat intolerant try products made with organic, stoneground wholewheat (or rye, or spelt) flour and all natural ingredients before ruling out wheat or gluten entirely? I’m also a little suspicious of any diet that promotes a high consumption of soy. I do eat and enjoy soy and some soy products – but only when they’re made with organically produced soybeans and without artificial additives. If you don’t buy organic soy products, you are most likely consuming Monsanto GE Roundup Ready soybean – and getting a nice side serving of glyphosate! I agree with the comments about how misleading the ‘all things in moderation’ statement can be. Sure, one coke once in a while isn’t going to do you any lasting harm…one piece of cake on the odd occasion isn’t going to kill you…a few slices of pizza every now and then isn’t that bad for you…and before you know it ‘moderation’ adds up to a potentially high consumption of a whole lot of ‘fake’ food that does nothing for you. Cancer completely aside, there are other reasons beyond the impact on your health to change your consumption patterns and buy more locally grown and produced food (organic where possible) – look at the abysmal practices a number of multinational companies engage in eg Coca Colas track record in developing countries such as Guatemala and India and the impact McDonalds has had on deforestation in South America. 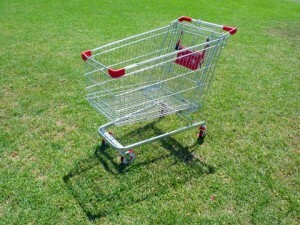 Any time you buy a given product, you are indirectly supporting the practices of the company that produces it.